You back up data on your computer in case it crashes, and you might install LoJack on your car to help recover it in case someone steals it--so why shouldn't you protect your Android phone? Most people carry a lot of sensitive data on their phones. If someone steals your handset or if you happen to lose it, all that personal information is suddenly not so personal anymore. Your phone is an investment, so you should safeguard your contacts, photos, texts, videos, and music. Even if you never lose your phone, certain downloadable apps can easily access and distribute your information. Not all the apps you find are 100 percent honest about what they do. Recently an SMS Trojan horse posing as a media player began infecting Android phones on Russian networks. Once the victim installed the malicious app, it began sending text messages to premium numbers, leaving the user with a huge phone bill. And in October, yet another spyware app reared its ugly head, forwarding all of the victim's text messages to a designated phone number without their knowledge. Thankfully the Android Market offers a variety of security options--some better than others, and all with different features. Here are some of our favorite apps for securing an Android phone. Our favorite app of the bunch, Lookout Mobile Security should be one of your first stops on the Android Market after you buy a new Android phone. Lookout accounts come in two flavors, free and premium. A free account lets you scan your phone for malware, back up and restore your data online, and use GPS to locate your phone should it ever get lost or stolen. Lookout has even been in the news for helping someone recover a stolen phone. You can upgrade to a premium account for only $3 per month (or $30 per year) and gain remote locking and wiping capabilities, as well as enhanced backup and Privacy Advisor. The latter gives you a detailed look at which apps can access certain information, such as location and identity information, and outlines the risks of having such applications on your phone. The free version is great for basic phone protection, but you'll likely want to shell out the cash for the extra features. Smartphones hold a lot of valuable data: Text messages, e-mail, and even credit card numbers can reside on the device, where they're easily accessed. If you lose your phone, you run the risk of having your identity stolen. Sure, you can set up a lock pattern, but we have seen such measures circumvented in the past. Symantec's Norton Mobile Security (beta) allows you to remotely lock and wipe your phone by text message, so that whoever finds it can't immediately go on a shopping spree in the Android Market with your money. You can even lock down the SIM card so that a thief can't swap it out to another phone. Beyond that, Norton permits you to block calls and text messages, as well as to scan your phone for malware. Although the program is still in beta until the end of the year, Norton Mobile Security is a superb choice for anyone who wants complete cell phone protection. WaveSecure Mobile Security offers many of the same features as Norton but requires a $20-per-year subscription for you to use them all. Like Norton, WaveSecure gives you the option to wipe and lock down your phone remotely. Unlike Norton, however, WaveSecure doesn't scan your phone for malware; instead, this application backs up your phone data and allows you to restore the files to another device. 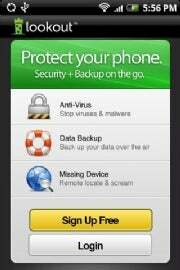 If your phone breaks or someone steals it, you can restore your phone from a backup quite easily. If you are worried that a phone thief will recognize the app and try to uninstall it, you can download WaveSecure UninstallProtection, which will prevent a user from uninstalling WaveSecure without first typing in a password. Another big name in computer security, AVG Antivirus Free scans your apps, settings, media, and phone contents in search of suspicious files. Have a text message with a shady-looking link attached? Run the scanner to see if it's a possible threat to your phone's security. Features that the creators will add in the future include the ability to lock apps and back up data. As the utility stands now, if you seek only to keep your phone malware-free and you don't really care for the extras, AVG Antivirus will fit your needs. Although NetQin Anti-virus provides features similar to those of Lookout, its focus seems to be on helping you recover your lost or stolen phone. With NetQin's Anti-lost feature, you can track your phone, erase its contents, lock it down to prevent "illegal use," and have your phone emit an alarm that sounds similar to a loud police siren. NetQin Anti-virus is perfect for people who are constantly losing their phones and who don't want to pay extra money to replace them. Any of the above apps may help you prevent information theft, but it's still important that you remain aware of your surroundings when using your phone. The best way to prevent phone theft is to keep your valuable electronics out of sight when you're not using them, and to try not to use them when you are walking outside in the dark alone. What are your favorite Android apps (in any category)? Let Armando Rodriguez know. He's PCWorld's Android app specialist.